If you haven’t noticed, my favorite way to prepare veggies is to roast ‘em off in the oven. I love how roasting concentrates and intensifies flavors. Plus, you don’t really need to babysit the vegetables as they cook in the oven, and – best of all – prep time and clean-up are minimal. Remember? I can be really lazy in the kitchen – especially, at the end of a week working graveyard shifts. When I got off work in the morning, I washed and peeled the carrots I’d received from my CSA box on Friday. When I cut up my veggies for roasting, I try to make them uniform and not too small or they’ll burn too quickly. Then, I bagged the prepped carrots in a gallon Ziploc bag and went to bed. 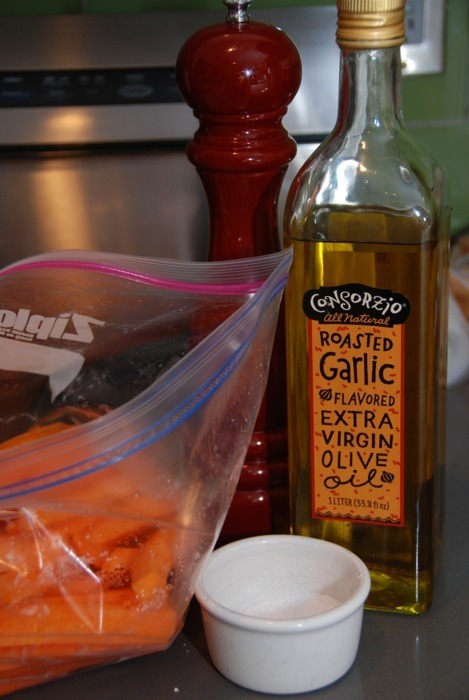 *Update (1/17/11): You can use lard, ghee, or coconut oil to roast veggies if you don’t have extra virgin olive oil. Then, I mixed everything together in a sealed Ziploc bag. 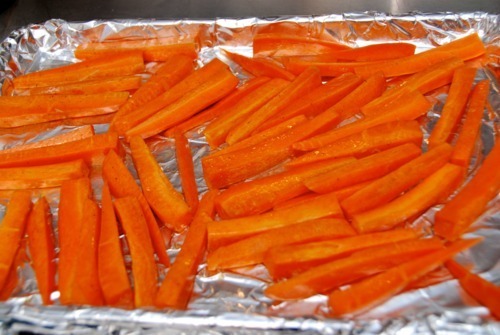 The carrots take around 30-45 minutes to roast off, but I set my oven timer for 10 minute intervals at the beginning and 5 minute intervals near the end to remind me to rotate the tray and flip the carrots. If you wanna get all fancy, you can toss some minced garlic and microplaned ginger to the tray when you take it out of the oven. The residual heat takes the bite out of the ginger and garlic. 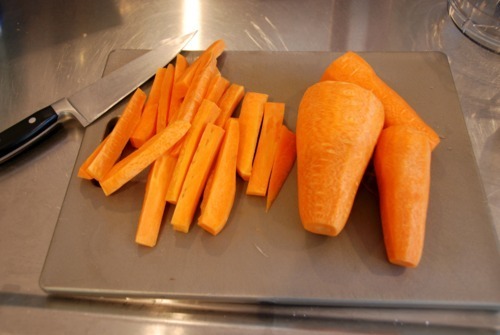 After I plate the carrots, I like to add a splash of vinegar (e.g. Trader Joe’s Orange Muscat Champagne vinegar or aged balsamic). You’ll dig ’em. I promise. 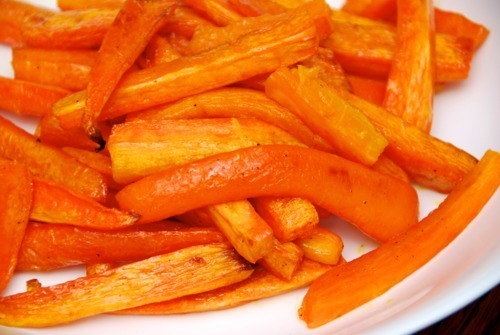 *Update on 5/16/11: another great variation is to toss the carrots with melted fat, Madras curry powder, salt, and pepper before roasting. When it’s finished, top the carrots with chopped cilantro and a squeeze of lemon juice. Yummy!